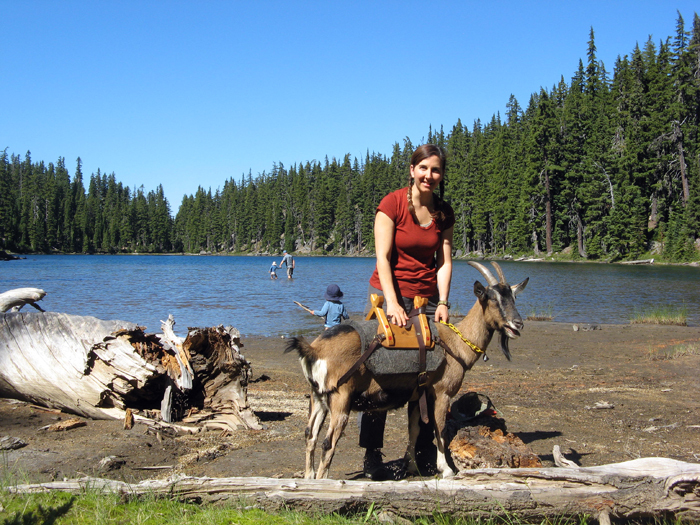 We spent a lovely Labor Day weekend in the wilderness with good friends and goats, complete with great weather, a pristine alpine lake all to ourselves, and lovely views. We were in the Diamond Peak Wilderness, in Oregon, and only a few miles away from the spot where we backpacked with goats for the very first time. 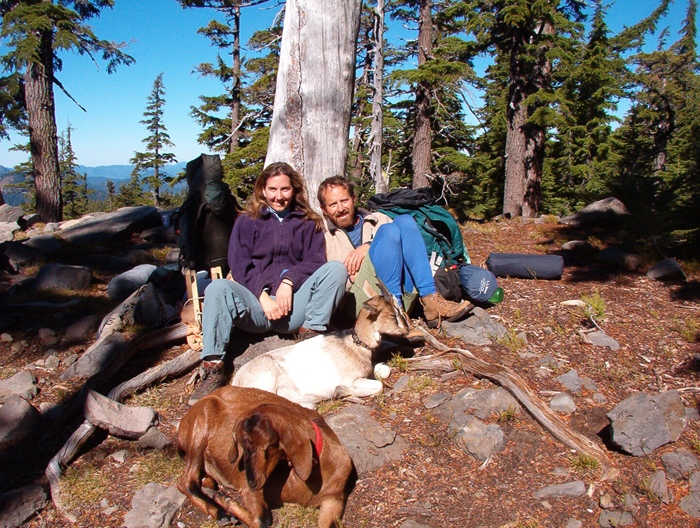 It was 2006, just a few weeks after our wedding, and we decided it was time to take our goats into the backcountry. Inspired by the book The Pack Goat, by John Mionczynski, we had been training our goats to follow us on hikes around the property. Being herd animals, our dairy goats followed us quite readily, and we found it was quite fun and easy to go on walks with them in line behind us. 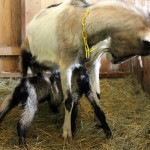 So, on a warm late summer day, we loaded up three goats – our Alpine goat Rose, her kid Lupine, and a Nubian named Hazelnut – in the back of our friend’s VW van and drove into the wilderness. With makeshift packs on the goats backs, it was an exciting first outing. Did the goats try to eat our dinner? Sure! Did they engage in mischief on the trail? You bet!! But the udder (pun intended) bliss of spending time with goats in the backcountry was an experience that was completely unforgettable. We were hooked. Rose and Hazelnut on the Divide Lake trail, September 2006. Lupine and Hazelnut join us for a mid-day sun break. Near Divide Lake, 2006. 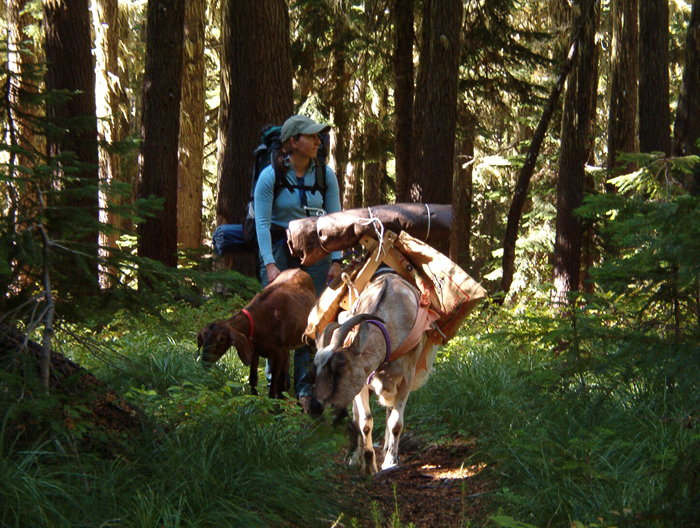 Fast forward six years and over a dozen goat packing trips later, and we still love it. 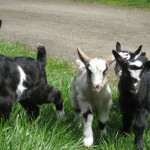 While our first trips were primarily for the fun of bringing our goats camping, and the enjoyment of fresh milk, bringing goats on later trips became something of a necessity. As our family grew, we relied more heavily on our goats to carry the bulk of our gear, as we carried small children on our backs. 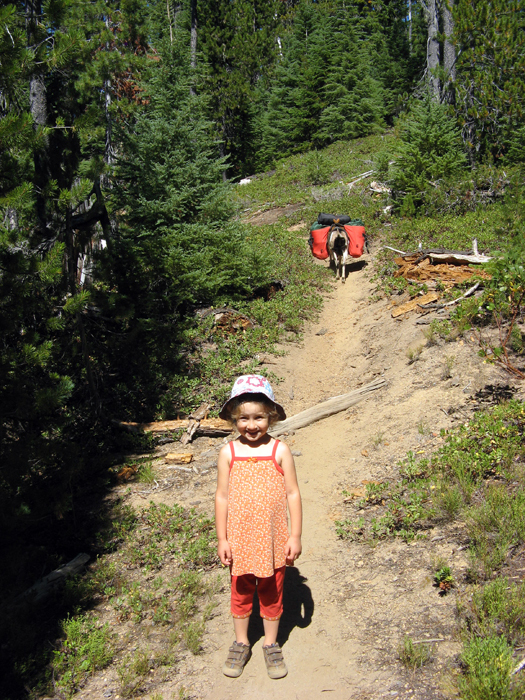 On this trip, I carried Everett and a small day pack, Brian carried Ella in a kid carrier with gear strapped on to the outside of the pack, and the goats carried the remainder of our gear, approximately 20-30 lbs each. Our packing gear has become more sophisticated over the years, as has our herd management. While we allow them to walk freely on the trail, we keep them tethered in the campsite, to keep them out of our food and away from small children. We allow them to forage for fresh browse, but also carry grain as a supplement. And each morning, we milk fresh, sweet milk for our morning tea. It doesn’t get much better than this. Ella, with a fully loaded up Calyso behind. 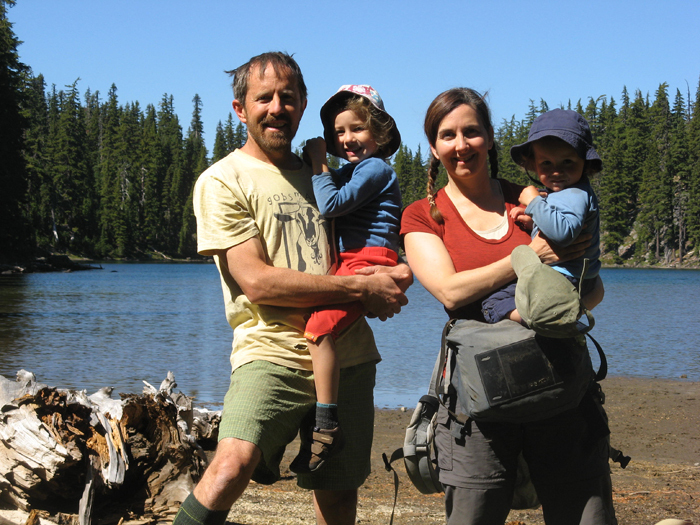 Diamond Peak Wilderness, 2012. Gilly takes the steep section slow and steady. Me and Calypso at Marie Lake. I always appreciate our farm animals, but I am especially grateful to our goats for making it possible for us to still enjoy the backcountry as a family. What an amazing adventure and such a lovely tradition. Thanks!! 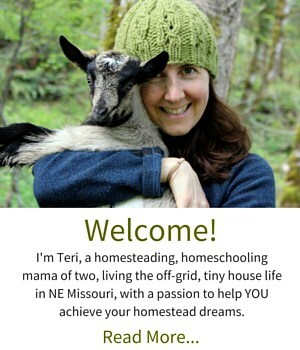 It can be overwhelming thinking about packing and preparing for a goat adventure, but once we get out there, it’s all worth it! That is very cool! What about bears/cougars etc stalking/attacking the animals and you guys? Here in BC canada even bringing your dog is highly discouraged unless you are hunting and have some way to defend yourself from an attack. Yes, running into bears and cougars is a risk even in Oregon. But then again, we’ve had one of our goats (the kid in the photos, Lupine) killed by a cougar in our own backyard, and the only time I’ve ever seen a bear in my 13 years of living in Oregon was also in my backyard!! Also, the trails we are doing with 2 kids and a few dairy goats are really only 3-4 miles in and pretty popular trails, so perhaps the presence of so many humans deters bears and cougars. We are always aware that it could be an issue, but the likelihood seems very small. Wow! Goat Packing! I’ve packed with horses, and have even packed myself with a dreadfully heavy backpack for a trip into the wilderness. Never thought about using goats. You made me smile today. We have some friends that have been trying to conduct a drive-by-goating for the past few months, but as of yet, we have averted the drop-off. 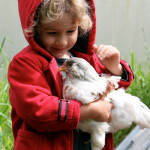 We’re pretty busy already with chickens, dogs, and horses. A drive-by goating! That sounds adventurous!! Yes – goats are amazing for backpacking. Most people use wethers, which means that they are stronger and can carry more weight. But even our dairy does help us out a lot!! That is so remarkable – I have never seen that! Excellent! 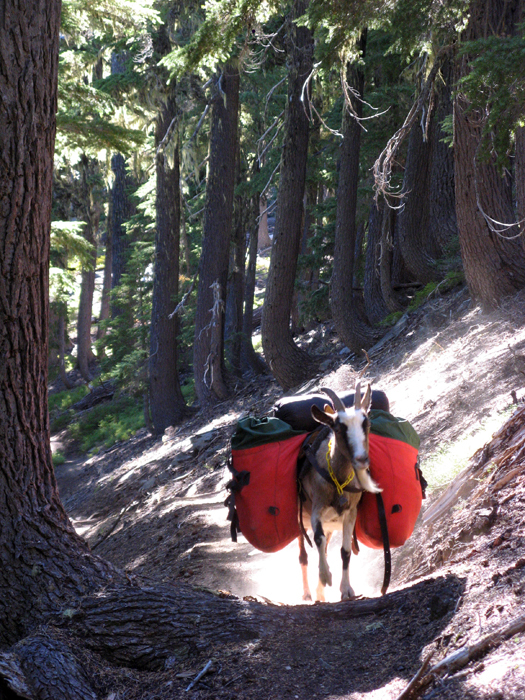 We have never seen any other goat packers out on the trail, but I know they are out there!! 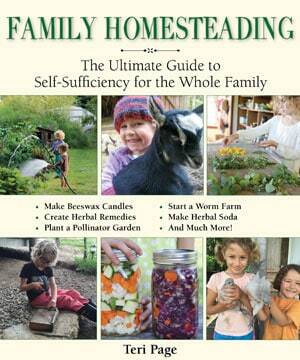 Taking them with you also means you don’t need to find someone knowledgeable and available to milk them daily. Brilliant! Exactly!! So many reasons to bring the goats on the trail! particularly when most of our regular milking subs are friends that also like to go backpacking with us! Thanks so much for sharing this! 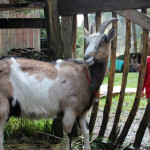 My daughter starting 4-H this year and is doing packgoats for her project – I am sharing this post with her right now! That’s Great, Mel! I Am Excited To Hear How It Goes For Her! I’m happy to share a short excerpt (a few sentences) from a blog post, with links back to the original site. Thanks for asking!